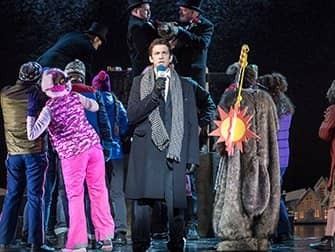 Groundhog Day on Broadway tickets are simple and convenient to purchase before your departure to New York. Buy your theatre tickets online to save time and money. The musical Groundhog Day is playing in the August Wilson Theatre and is based on the popular 1993 movie of the same name. Tim Minchin, who also wrote the music for Matilda, the musical, has penned both the music and lyrics for this musical. Groundhog Day is about self-centred weatherman Phil, who is sent to report from a small town on the American holiday, Groundhog Day. Here he finds himself trapped in a time loop, where the days keep repeating themselves. It’s the third time that Phil, along with cameraman Larry and producer Rita are sent to Punxsutawney. While there, he must report on the performance of resident groundhog, Punxsutawney Phil. Whom is believed to be able to predict the length of the winter. Phil is not enthusiastic about his project so he uninterested and grumpily goes about his job. When the team are finally ready to leave, a snowstorm hits Punxsutawney. Consequently, Phil and his team are forced to stay overnight. When Phil wakes up the next morning, to his surprise it is Groundhog Day again! He has to repeat the same day over. Then the next day, and the next…. After waking up yet again on Groundhog Day, Phil realises that he can use his past experience of the day to his advantage. Will he win the heart of his colleague Rita and break the time loop? 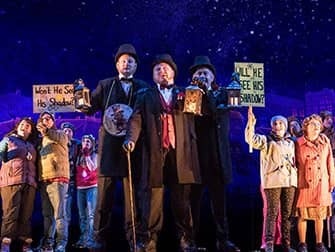 How to buy Groundhog Day Tickets?